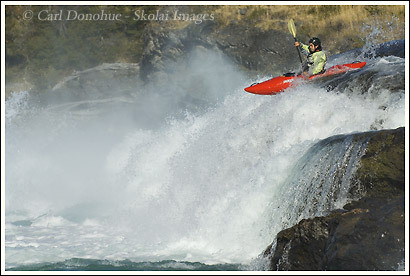 Whitewater kayaking photo Baker River, Patagonia, Chile. Simpler times indeed. Last year at this time I was in the Andes Mountains with some good friends, on a trip to the Rio Baker, or Baker River, Patagonia, Chile. A series of insane Class 5 and 6 rapids make this one of the biggest whitewater kayaking runs in the world. This is the first of the 4 rapids, a cool drop over a waterfall. This kayaker is my friend from Futaleufu, Chilean native Memo, who’s real name is Guillermo – we just called him Memo. It was his first time on a river this size, and he paddled it with aplomb. I’m hoping to get back down to Chile maybe next winter and revisit some old friends and places. We’ll see if that happens. This entry was posted in Adventures, Chile, Kayaking, People, Travel on March 20, 2008 by Carl D.
Man, that looks like so much adrenaline!!! But what a great way to have fun. When I had my back surgery I thought I might go insane from boredom, being stuck in the house and not being able to even walk well enough to go check the mail without stumbling. I love the outdoors, always have. That came from me chasing down my brothers’ & Dad, who were always going camping,fishing,etc… So I became a tomboy & could usually keep up with whatever they were doing. There is no greater feeling to me than to be outside enjoying nature & all it has to offer. There are so many places I’d love to see, but unless I can figure a way to go on a shoestring budget they are out of reach for me. But websites like yours & Marks’ provide a glimpse of things I may never see otherwise. You can look at a picture in a book, but it’s not the same as the pictures that you two provide, almost like I am right there experiencing the trip myself. Without getting TOO mushy, It helps me enormously! And I’m sure that when things return to normal for me, I will still have to bait the hooks of many a male & female fisherman, adjust their backpacks, & tell the women that, No, you can’t hike in those Nine West high heels!! And then they ask: Are there really bears in those woods?Ha!Ha! It’s all good!! It’s a lot of fun if you know what you’re doing. If not, it’s a lot of hassle. That’s a total bummer about your back – I hope your recovery is going well, and you get back out there ASAP. It’s no fun not being able to enjoy the woods. By the way, you can always go to some places on a shoestring budget .. ya just gotta be willing to deal with hostel accommodations, or camping, making your own meals, hiking, etc. My first trip to Alaska, I spent 6 weeks here for under a grand, and that included 2 fly-in backpacking trips in Gates of the Arctic National Park and Wrangell St. Elias National Park. If I’d skipped those and just done trips that I could walk to, it would’ve been WAY cheap. I did a little hitch-hiking, but could’ve used shuttles and buses more for a little bit more cash. Hey Carl, thanks for the tips. I have no problem with camping & hiking. But the airplane trips were what worried me about Alaska. I’ve looked at some that are just outrageously expensive! But that’s pretty cool that you stayed there 6 weeks for under a thou!! Thanks for the well wishes. I’m sure I’ll be back out there in no time! You stay safe!! Just shop around early for a cheap flight to AK .. they’re definitely not as low as they used to be, but you can sometimes find a bargain.